We face a ‘new paradigm’ for financial planning and retirement provision, according to Prudential’s executive director, distribution, John Warburton, who believes George Osborne’s Budget announcements very much suit the insurance giant over the medium to long term. “Our priority this year is to continue developing our product propositions even further in response to those [Budget] changes so that we can give advisers a wider range of flexible solutions that suit the post-April 2015 world. Warburton says the group has done this by focusing on its core assets – the Prudential brand, its financial strength and a multi-asset investment capability that holds risk management at its core. “We have always based our product range around providing guarantees and longevity risk management. The new freedom and flexibility that the Budget introduced means our approach has never been more appropriate,” he adds. Warburton foresees an escalating level of product innovation across the industry – due in part to the Budget but also in response to a growing demand for more flexible financial planning and at-retirement solutions. He says the advent of the New ISA (or Nisa) together with drawdown products will become more attractive as demand from consumers and advisers grows, while the need for alternatives to annuities will drive innovation – both from Prudential and the broader industry. Advisers can feel reassured they will receive the same level of dedicated support when navigating the inevitable industry changes that the Budget will spur, as they received during their RDR journey. 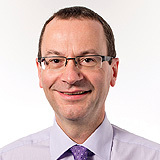 He says the extensive programme of training and information – available largely through its adviser extranet www.pruadviser.co.uk – ensures that from a technical perspective and through its scenario-based modelling tools, advisers should be suitably armed to face the changing distribution landscape. This is also underpinned by Prudential’s account management, business development and business consultancy services that are available to financial advisers. Warburton stands by the company’s decision not to invest in its own fund platform, failing to see a viable business case at this point. Rather, he urges advisers to ‘watch this space’ for wider availability of Pru’s multi-asset investment propositions, as they are listed on more third party platforms over the second half of the year. Warburton says the new world should be viewed as a broader opportunity set for an adviser rather than posing a threat. “We are very bullish about the adviser market in general, witnessing a transfer of responsibility from the state and employers to the individual taking on a greater responsibility for their own long-term financial needs, and taking on more risk to their own personal balance sheets,” he adds. Even against a backdrop of increased direct-to-consumer activity and a potentially more complex distribution landscape for advisers to wade through, Warburton feels strongly that a greater financial awareness will only help grow “the overall size of the advice market”.